When she wasn't being shunted from one foster home to the next, Piper Weiss spent the first twelve years of her life in an orphanage. But everything changes when a dark stranger shows up claiming to be her father. Things get even weirder when Piper is taken to live with her uncle, who happens to be the world-famous magician and escape artist, Harry Houdini. And Houdini is not at all pleased about having a curious twelve-year-old running around his home. Piper attends school, gets detention on her first day, and meets some friends who will help her unravel the clues to her mysterious past. But something sinister and powerful has been unleashed in New York, an evil force hell-bent on bringing about the Apocalypse. Sideshow freaks are being murdered and it all seems to be leading to a dark ritual started twelve years earlier-the day Piper was born. How can Piper defeat this malevolent entity when she may be the reason for its very existence? 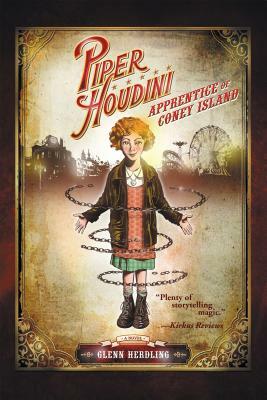 Piper Houdini: Apprentice of Coney Island is a young adult novel set in the Roaring Twenties against the hustling and bustling background of New York's Coney Island-a time filled with silent movies, secret speakeasies, and an unscrupulous Spiritualist movement that is the unwitting pawn in a plot to bring about hell on Earth. Populated with a cast of actual historical figures-including Sir Arthur Conan Doyle, Dion Fortune, and Aleister Crowley-this spine-tingling tale will appeal to readers who enjoy urban fantasy and paranormal historical fiction as much as a jaunt on the Wonder Wheel. Glenn Herdling, a graduate of Bucknell University and post-graduate of New York University, began his publishing career in 1987 as an editor and writer at Marvel Comics. He was born and raised in New Jersey where he currently works in the financial sector struggling to make insurance documents read like plain English. He has contributed to numerous published works and has written over 80 comic books. Piper Houdini: Apprentice of Coney Island is his first novel.